The location: The Comic Book Store. A. A comic book store. A. Somewhere in or near Miami. A. 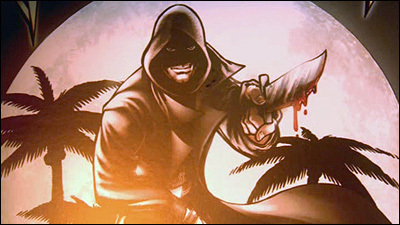 In Episode 5 (of Season 2), "The Dark Defender". The police investigate a murder at a comic book store. 'Denny Foster', a worker at the shop, is found lying dead on the floor. Dexter determines that he was bludgeoned with a large snow globe. No money was taken, so the motive is unclear. 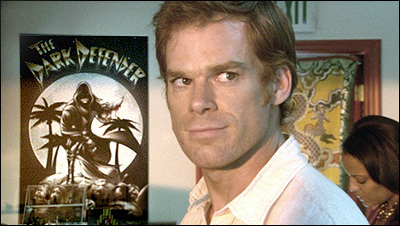 While there, Dexter spots a poster of "The Dark Defender", a new comic book hero based on him (the "Bay Harbor Butcher"), which the murder victim had created. A boardwalk, running outside the comic book shop, is seen later, where Sgt. 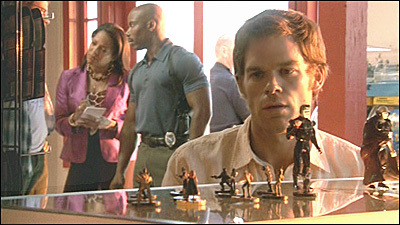 Doakes & Maria LaGuerta have a conversation. Doakes tells her that the victim was involved in an online feud with the suspected killer, and that the killer's truck was ID'd in the nearby parking lot, via a security camera. She tries to interest him in getting some counseling, since he has shot two people recently, but Doakes will hear none of it. A. A large, barn-like store at a tourist center, far from Miami. A. It is the green barn at Shoreline Village, a seaside shopping & dining center in Long Beach, CA. The building is on the boardwalk, near the middle of the village, just a few shops north of Parker's Lighthouse restaurant. It's northwest side faces the bay (and Shoreline Park across the bay), while the other, southeast side faces the center's parking lot (where they also shot two other scenes for the series). Over the years, this large building (empty at the time of shooting) has held a number of different businesses. 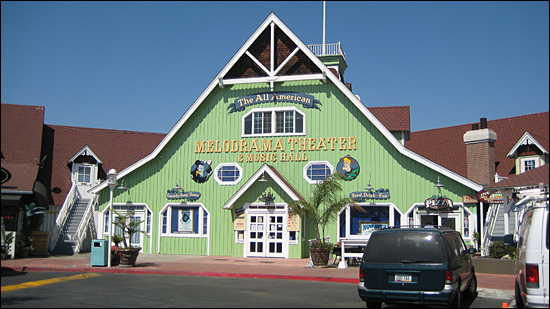 As of 2008, it currently houses the "All-American Melodrama & Music Hall", which puts on live stage productions of classic melodramas, holiday shows, improv comedy shows and small concerts. 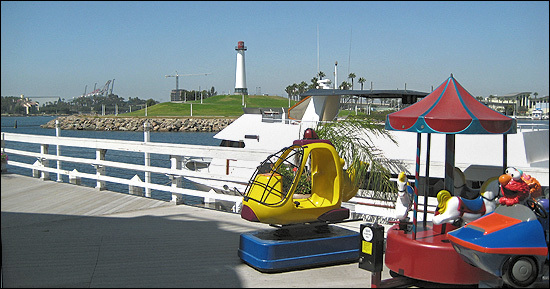 The address is 429-E/G Shoreline Village Drive, in Long Beach. (They have their own website at allamericanmelodrama.com. 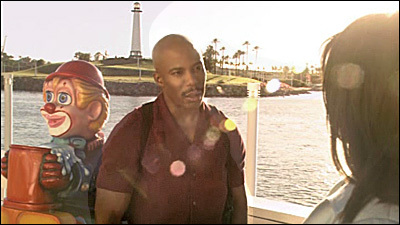 A later scene in the same episode, where Doakes & LaGuerta speak outside, was filmed on the boardwalk of Shoreline Village, not far from the green barn. And later still, they catch the killer by staking out the parking lot. There is a curve in the boardwalk, where the pedestrian path wraps from westbound to southbound, where you'll find a small collection of coin-operated kiddie rides. You can see one of the kiddie rides during the scene. The barn is located at this northwest corner. In the background of that scene, you can glimpse the skyline of downtown Long Beach, and in another direction, you can see the lighthouse at Shoreline Park across the bay (not to be confused with Parker's Lighthouse restaurant, which is on the other side, in Shoreline Village). And in yet another view , you can see the round, gazebo-like ramp leading up to the pedestrian bridge that crosses Shoreline Drive (which is where they filmed the scene where LaGuerta warns Doakes to lay off Dexter). Here is an aerial photo of the building. And here is a map link. 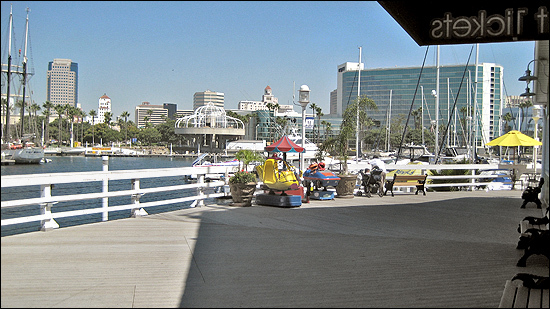 Numerous other scenes from "Dexter" have been shot in this general area, including multiple scenes at Shoreline Village, the area around the Queensway Bridge, in Shoreline Park, and at the Coast Long Beach Hotel. A. This one could have been difficult, except for one thing: Tim Grobaty, my pal at the Long Beach Press-Telegram, mentioned long ago, in one of his daily columns, that the "Dexter" crew was filming at the green barn at Shoreline Village. So, naturally, I kept my eyes open for it. The scenes shot inside the "comic book store" would have been very difficult to identify (as interior shots always are), if that had been all I had to go on. But fortunately, there was also that outdoor discussion scene, which made it easy. I first identified the location on the boardwalk as being Shoreline Village. I know it well. Also, in the background of that outdoor scene, I spotted buildings I know to be on the Long Beach skyline and that pedestrian bridge ramp, and then I spotted the Shoreline Park lighthouse (which is hard to miss). So it was fairly easy to line up the background locations and determine just where they were when they shot that scene. So the challenge was to decide which building at the Village was used for the interior shots. That's where Tim came in. All I had to do was take a closer look and see if the interior matched up to the green barn. 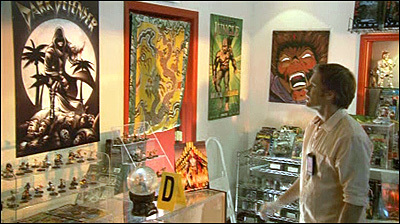 In the outdoor scene, the opening seconds are filmed from inside the comic book shop, looking out the windows at the boardwalk. And in the background, one can clearly see in the distance the profile of the Aquarium of the Pacific, another Long Beach landmark (and the location of a later Dexter scene). Then I noted the unusual slanted windows on each side of the (wood & glass) door to the shop shown on the show. Those side windows perfectly matched those on the northwest side of the barn. Case closed.